I made carrot cake cupcakes for Easter. 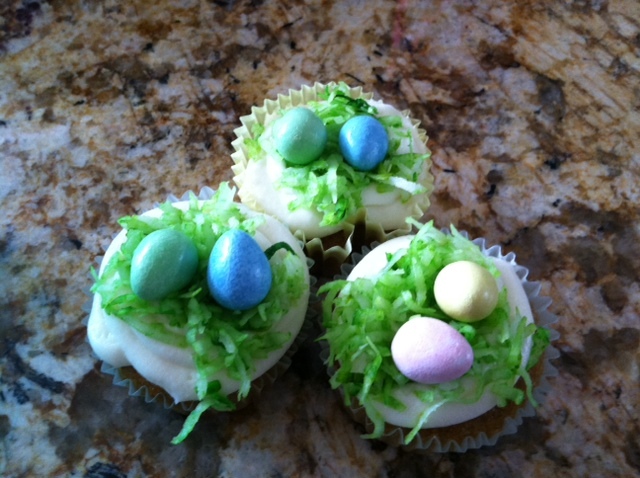 It's my normal carrot cake* recipe, but I made it into cupcakes and decorated with my cream cheese frosting, dyed shredded coconut green for grass, and added Reese's eggs on top. It was a big hit at our Easter celebration/egg hunt! *Carrot Cake recipe is the easiest, and tastiest recipe I've found to date! If not making cupcakes, simply pour into 9x13" greased pan, and bake at 350 degrees for 35-40 min. Yum! Combine dry ingredients. Add sugar, egg, and oil. Mix well. Add carrots, pineapple, and nuts. Bake in greased 9x13" pan at 350 degrees for 35-40 min.